The Roja Muthiah Research Library (RMRL), founded in 1994, exists to provide research materials and facilities for students of Tamil studies in a variety of fields spanning the humanities, social sciences, and sciences. The Library's main objectives are to preserve, catalog, and expand the collection of Roja Muthiah, who during his lifetime amassed one of the world's finest private libraries of Tamil publications. The Library's notable strengths are its holdings in classical and modern literature, literary criticism, medicine, cinema and the related culture of printed works (such as song books), folklore, material by and about women, religion and philosophy, and numerous publications of historical value. The collection is comprised of more than 100,000 volumes of books, journals, and newspapers. In addition there are rich holdings of oleolithographs from Ravi Varma's workshop, nearly 30,000 journal abstracts and indexes, an enormous collection of clippings, drama notices, wedding invitations, business and family correspondence, and palm leaf manuscripts. Most of the publications date from the later half of the nineteenth century and the first half of the twentieth. Located in Chennai (formerly Madras), RMRL was opened early in 1996 to research scholars working with Tamil language materials. Access to the Library's catalogs through a World Wide Web page on the internet has been available since 1995. Roja Muthiah began his collection in the early 1950's, after leaving the village of Kottaiyur for Madras where he started a sign-board painting business called "Roja Arts" (from whence comes his name "Roja", meaning "Rose"). He first scoured the book stalls of Madras' Moore Market in order to inspire ideas for his sign-boards, but soon became enthralled by the books themselves. He started to collect them, sometimes purchasing them in large sacks by weight or volume. After his entire collection was stolen once and then twice from his Madras flat, he moved his books and himself back to Kottaiyur to stay. From then on, it was in his ancestral house in Kottaiyur where, until his premature death on June 4, 1992, you would find Roja Muthiah reading, compiling, and writing with the help of his daughter and two assistants, amidst heaps and shelves of books, clippings, journals, and artworks. Over the years Roja Muthiah mined treasures from book stalls all over Tamilnadu, and gradually the library outgrew the house and spilled over to fill two rented sheds on nearby streets in the village. Roja Muthiah is said to have spent sixteen hours a day among his books. His daily labor was these hours he spent reading the books he purchased, indexing, cross-referencing, and finding space to store them. Ironically, it was his lifelong effort to preserve the life of his library that shortened his own life, as every month he dusted his shelves as well as his lungs with insect poison. In the last years of his life, his health fading, Roja Muthiah worried that his death would mean the demise of his collection as well. C. S. Lakshmi, a visiting fellow in the University of Chicago's Institute for Culture and Consciousness, who had used Muthiah's collection for her research on women in India, knew from previous discussions with Muthiah that he was concerned about the future of his library. Hearing of his death, Laksmi informed friends at the University of Chicago Library. The University of Chicago launched a global effort to preserve Roja Muthiah's library. The effort began with letters back and forth between the University and Roja Muthiah's family. Four trips from Chicago to Kottaiyur and Madras followed the letters. All of these activities were guided by a Steering Committee of scholars including: Prof. A. K. Ramanujan, Prof. Norman Cutler, Prof. Arjun Appadurai, Prof. Ralph Nicholas, and others at the University. From the outset, everyone was committed to keeping the library, an important cultural resource invaluable to Tamil scholars, in Tamilnadu. MOZHI, a public trust located in Chennai and dedicated to developing resources in Tamil language and culture, collaborate from 1996-2004 in the project to preserve and maintain the collection. In 2005 a new public trust named the Roja Muthiah Research Library Trust was formed to manage RMRL and provide for its development. On 23 April 1994, the library, carefully squared into waterproof boxes, was loaded onto four lorries and a trailer. The convoy headed away from Kottaiyur in 43 degree C, back to Madras where the library began, and now from Chennai reaches all corners of the globe. First attention is focused on publications for historical inquiry, ancient and medieval literature, medical texts, performance literature, and folklore publications. Grants from the U.S. Department of Education, the National Endowment for the Humanities, and the Ford Foundation along with collaboration from the Wellcome Institute for the History of Medicine made possible the earliest descriptive and preservation efforts. Preliminary electronic catalog records were created during 1995 for all the titles in the Library and the preservation microfilming facilities were in operation. To date, more than 15,100 volumes have been preserved on microfilm and the corresponding cataloging records enhanced with full descriptive data. Ownership of the RMRL collection is being transferred to the Roja Muthiah Research Library Trust as cataloging and preservation work is completed. This transfer will be accomplished by 2008. Responsibility for maintenance of the library into the future will rest with Tamils. The 2010/11, 2009/10, 2008/09, 2007/08, and 2006/07 annual reports of the Roja Muthiah Research Library are available on-line. The Roja Ital, a quarterly newsletter from RMRL, for January 2012 and April 2012 are available on-line. The central reading room of RMRL is dedicated to the late A. K. Ramanujan, poet, folklorist and Tamil scholar. Ramanujan introduced Sangam poetry to the English speaking world. A teacher of teachers, Ramanujan trained and inspired most Tamil teachers currently working in the U.S. Ramanujan was Professor in the departments of South Asian Languages and Civilizations and Social Thought at the University of Chicago until his death in 1993. RMRL is open Monday through Saturday except that the library is closed second Saturday of every month. 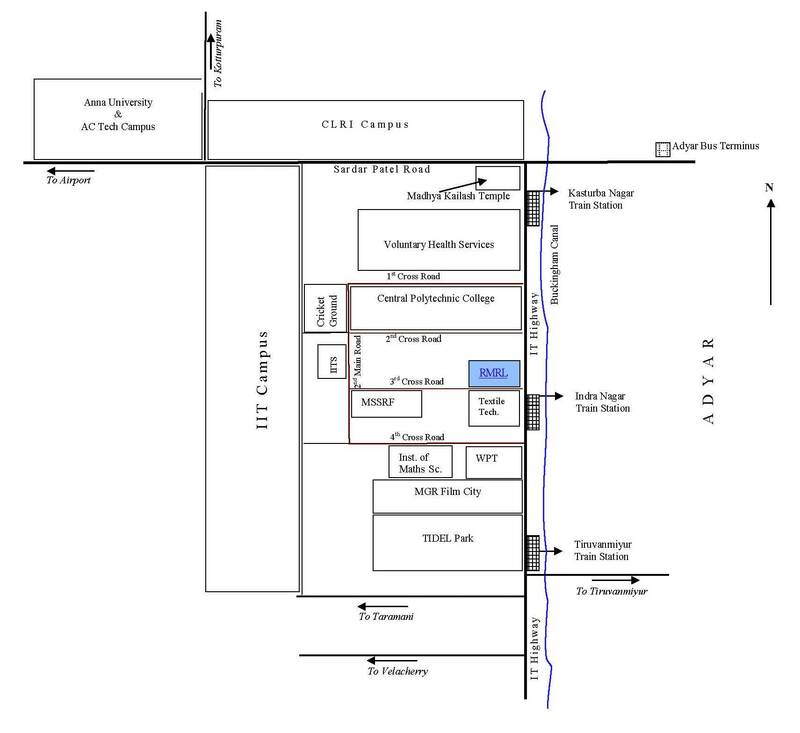 Office timings: 9.30 a.m. to 5.00 p.m.; lunch 1.00 to 1.30 p.m.
Roja Muthiah Research Library is located in Central Polytechnic (CPT) Campus, Taramani -- to the west of Adyar just opposite to Indira Nagar train station. It is approximately 13 km. from Koyambedu bus station, 13 km. from Chennai Central Railway Station, 12 km. from Chennai Egmore Railway Station and 10 km. from the Chennai Airport. Regular train and bus service is available to Roja Muthiah Research Library.